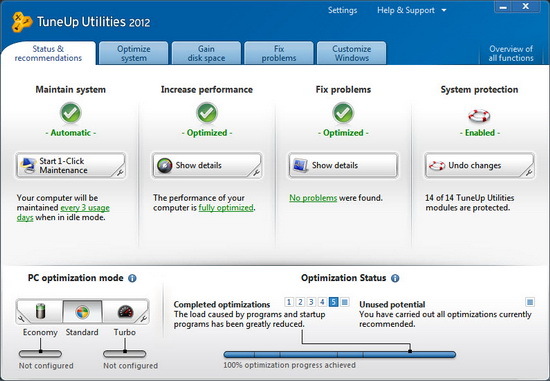 TuneUp Utilities 2012 is software which can optimize the capability of your windows based computer or notebook. By using this program, windows operating system which you use will be faster, lighter, and more comfortable when used. Tune Up Utilities are one of software which is really recommended because without needing any special ability we can keep the performance of our computer. Other than making windows operating system faster, TuneUp Utilites can also be used to adjust your windows system interface, like changing the interface of icon, boot screen, logon screen, visual style, and others. What interested from TuneUp Utilities is we also given options to analyze our internet connection and adjust computer setting to maximize it with the internet connection that we used. 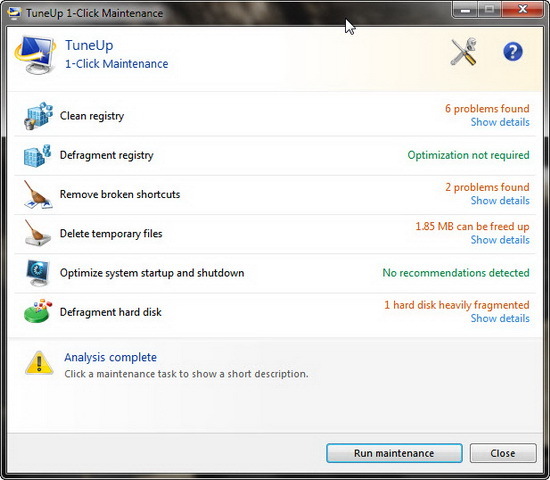 Feature TuneUp 1- Click Maintenance which is the best product of this program still available and still become on of the advantage of TuneUp Utilities. With this feature, only one click is enough to automatically repair and increase the windows system performance. TuneUp give high attention to system stability, so windows will not stop working or will become really slow when optimized with this program. And most change that you made can be undone with TuneUp Rescue Center easily and safely. TuneUp Utilities will automatically do maintenance jobs which important to you, make you knows every problem and offer a simple solution. This thing guarantees that performance will always be the best. A slow computer and messy computer now will become better. Does your laptop battery go flat just before the end of a film? Is your desktop PC pushing up your electricity bill? TuneUp Utilities is putting a stop to all greedy energy-guzzlers! The brand new TuneUp Economy Mode improves the energy management on laptops and even helps desktop PCs to turn green. With almost every program installation, a degree of performance and stability is lost – nearly every PC user is familiar with this exasperating problem. The improved TuneUp Program Deactivator™ re-enables disabled programs while they are in use and then disables them again automatically so that the load on your PC is always kept as low as possible. TuneUp Utilities gives you full control over the key functions and modules of TuneUp Utilities with the new central settings dialog, all in a single window. I think that Tune-up Utilities interface incorporates and integrates all of its tools and utilities more seamlessly, compared to many other similar softwares, while offering a high-quality pc optimization service. Since the publisher behind this product has been in the industry for more than 10 years, each individual tool within this pc maintenance package is an efficient and well-developed feature.